This is the new Swansea City home kit 2012/2013, Swansea City’s new home kit for the 2012/13 season. 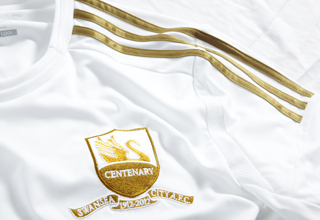 Swansea’s new 2012/13 shirt has been made by Adidas and was officially unveiled by the Swans on 7 June, 2012, a little over a month after the Swans released their 2012/2013 season away kit. 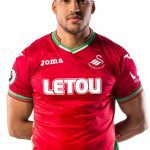 The new Swansea 12/13 home shirt retains its white body but the Adidas stripes on the shoulders and logo, sponsor’s logo (32Red) and club badge are all gold in colour to celebrate the club’s centenary year. Check out our site archives for more Adidas footy designs and Premier League kits for the new 2012-2013 season. This entry was posted in English Premier League and tagged Adidas on June 11, 2012 by Football Kit News. nice. is it a white version of chelsea’s new kit? im also reminded of Madrids last season kit. Real Madrid hand-me-down. I don’t like it. Totally understand what they’re going for, but it really does look like they swapped kits with Madrid for this year. Very nice. 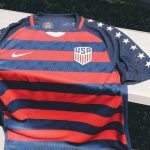 They’ll probably have black numbers and lettering, but they could go with gold. really…I don’t like it only because it looks too similar to Madrid’s kit from last season. at least it’s nicer than last years but every time I watch them I’m going to feel like I’m watching RM for a second or two. Adidas could have been more creative. They’re always so boring. It’s like the new Chelsea home kit. The gold makes a good impression. Not bad. This and the Bayern Munich away kit are my favourite new kits thus far. Worst are Liverpool’s away kit and Arsenal#s apparent away kit (Maroon).